More than 1 in 10 workers take family or medical leave from work each year, which represents more than 20 million people.1 But the options available to those who need to take time off from their jobs to recover from a serious personal illness or injury, to welcome a new child, or to care for a seriously ill family member are insufficient to meet the current needs of families. But those numbers only include workers who both needed leave and could take it. 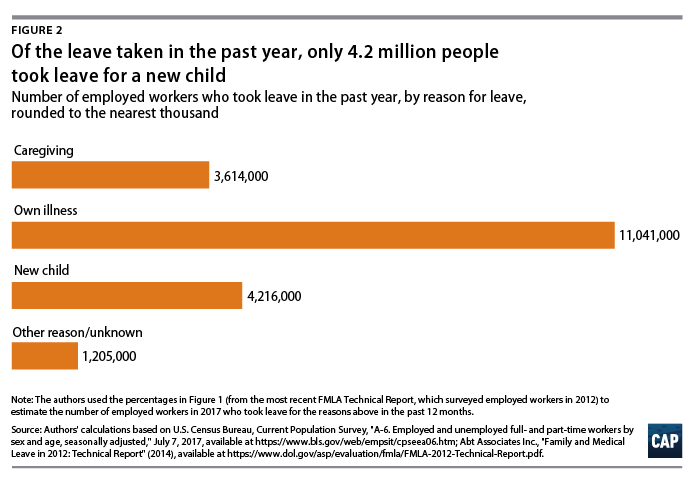 Another 7 million workers need leave but are not able to take it, and the most common reason reported is because they cannot afford to take leave—most likely because it is unpaid.8 And workers who need leave but are currently unable to take it are even less likely to be covered under Trump’s proposed parental leave-only plan. 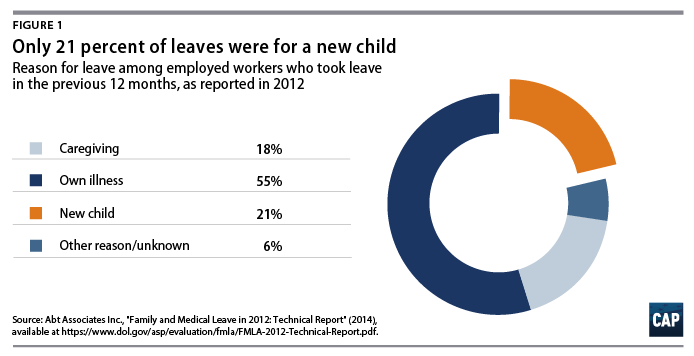 Only 9.2 percent of the workers who needed leave but did not or could not take it, or 647,000 workers, needed parental leave. (see Figures 3 and 4) Half of workers with an unmet need for leave—49.7 percent, or 3.5 million workers—needed time off to address their own health needs but were not able to take it. And an additional 35.8 percent, or 2.5 million workers, needed family caregiving leave but were unable to take it. Trump’s proposal would do nothing for the bulk of workers who have an unmet need for leave. In addition to only addressing a fraction of the reasons why workers need time off, major unanswered questions remain about the eligibility, implementation, and funding of the Trump proposal.9 The plan would implement an unfunded mandate to states to add a six-week paid leave benefit for new parents to their unemployment insurance programs. The policy would provide no benefit for workers who need personal medical leave or leave to provide care for a seriously ill loved one. It remains unclear who would be eligible for the plan, which is concerning, given that the current unemployment insurance system disproportionately excludes women, people of color, and low-wage workers, plus eligibility requirements vary by state. Moreover, Trump’s plan fails to address the current challenges that states are experiencing with their unemployment insurance programs, many of which are severely underfunded.10 It is important to distinguish myths from reality in the public debate about paid leave to ensure that policy solutions meet the needs of women, men, and families. Only 38 percent of all workers have access to temporary disability leave through their employers, with low-wage workers significantly less likely to have access to a policy.13 Workers employed in California, New Jersey, New York, and Rhode Island have access to state-run temporary disability insurance programs, while workers in Hawaii are required to be covered by their employers. But most workers either must cobble together a solution based on whatever vacation or other leave benefits they may have, take unpaid leave, quit their job, or keep working even if it is not medically advised. In addition to the 11 million workers who take medical leave and the 3.5 million who need leave but do not take it to address their own serious illnesses, 4.6 million take leave each year to provide care for a seriously ill family member, and another 2.5 million need family care leave but do not take it. The Trump paid parental leave proposal, which would require states to add a six-week parental leave program for new birth and adoptive parents through their unemployment insurance programs, is unworkable and underfunded.16 The plan ignores existing challenges facing many state unemployment insurance programs and would exacerbate funding shortages. It would push new costs onto states while ignoring the current reality that many state programs are already severely underfunded. According to the Department of Labor, only 20 states and the District of Columbia are sufficiently solvent to provide protections during a mild recession.17 Instead of making new investments that could strengthen the unemployment insurance system and bolster existing programs, the proposal would simply demand that states maintain a minimum level of reserves—without putting forth a plan or funding to help states to meet the requirement.18 Adding a new program without adequately addressing the issues in the unemployment insurance system risks destabilizing the system’s ability to continue providing current benefits to workers who become unemployed through no fault of their own. A state-by-state approach is not a substitute for a strong, baseline national standard that sets a floor of protections for workers. Such a standard is essential to ensure workers can access comprehensive paid family and medical leave when the need for leave arises. State innovation efforts can provide invaluable learning, but they work best when there is a strong baseline for states to build upon, while also ensuring that all workers have the leave they need. The Trump plan does little to foster state innovation because it forces states to provide a benefit through a particular structure, and then fails to provide any support to make the plan workable. Trump’s proposal is ill-conceived—it would put in place an inefficient, inconsistent program that would be difficult to administer and risk destabilizing the worker protections currently provided through the unemployment insurance system.20 While a sound federal program for paid parental leave could be an effective complement to a more comprehensive mix of paid leave policies, Trump’s program does not provide a sound foundation even as a supplement to a more robust program. Sunny Frothingham is the senior researcher for Women’s Economic Policy at the Center for American Progress. 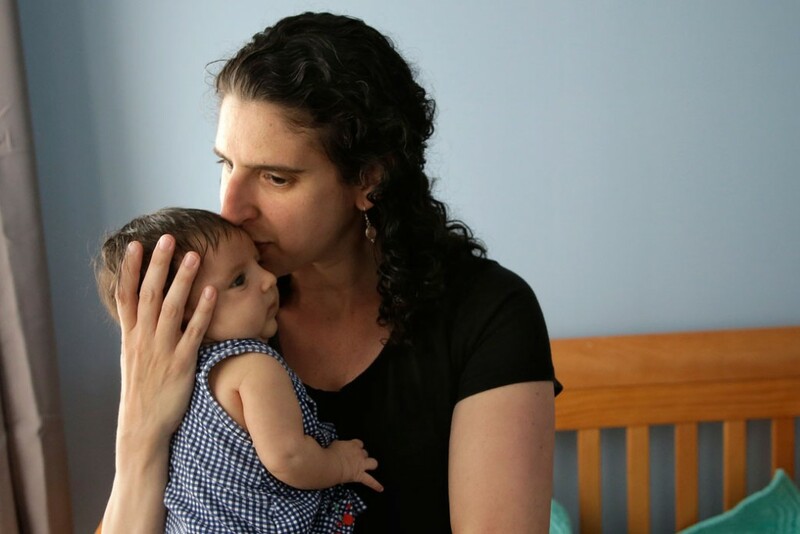 Sarah Jane Glynn is the former director for Women’s Economic Policy at the Center, and she provides expert advice to states and other entities exploring different ways to develop a comprehensive paid family and medical leave program.